Via Tyler Cowen, here’s a fascinating bit of research from Jialan Wang based on Benford’s Law. Benford’s Law tells us about the distribution of digits in many kinds of tabular data, including financial data. The digit 1 shows up 30.1% of the time, 2 shows up 17.6% of the time, all the way to 9, which shows up 4.6% of the time. If you examine some financial data, and the digits show up in the wrong proportions, it probably means the books have been cooked. Well, guess what? 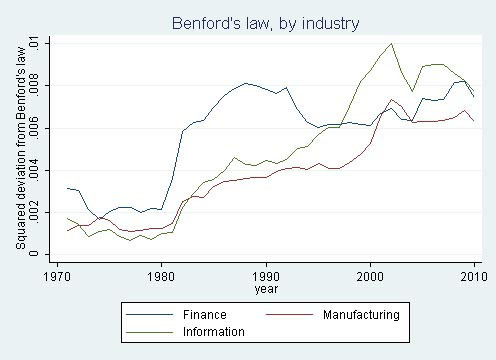 Back in 1960 corporate reports followed Benford’s Law almost precisely. Today? Not so much. The chart below shows deviations over time for three different industries. Finance took a big leap in 1980, when the S&L scandal was taking off, and then leveled out. IT and manufacturing took smaller jumps in the early 80s, bigger jumps during the dotcom era, and then leveled out at about the same rate as finance. But all three industries, and the business community as a whole, have deviations at much higher levels today than they did in 1960. While these time series don’t prove anything decisively, deviations from Benford’s law are compellingly correlated with known financial crises, bubbles, and fraud waves. And overall, the picture looks grim. Accounting data seem to be less and less related to the natural data-generating process that governs everything from rivers to molecules to cities. Since these data form the basis of most of our research in finance, Benford’s law casts serious doubt on the reliability of our results. And it’s just one more reason for investors to beware. I’m not surprised. But it would be interesting to do a similar study on European corporations to see if the same trend is evident. Is systematic book cooking mainly a Wall Street phenomenon, or has the entire world’s business community been getting less honest over time?